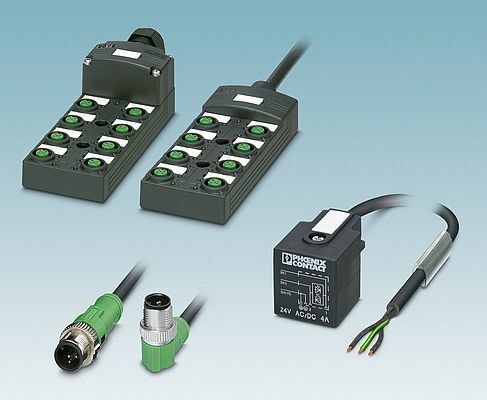 With the universal M12 distributor boxes from Phoenix Contact, actuator connectors, for example for solenoid valves, can also be connected quickly and easily. Thanks to the full wiring of the M12 slots, both the switching wires as well as the PE connection of valve connectors are safely and easily connected to controllers and relays in the central control cabinet. The wire cross sections of the permanently connected master cables (1.0 mm² for the supply wires and 0.5 mm² for the signal wires) are sufficiently large and have low cable resistances. If even larger wire cross sections are required, these can be flexibly connected to sensor/actuator boxes with plug-in screw connection or spring-cage connection. LED status indicators for distributor boxes and molded valve connectors, as well as the easy to operate M12 Speedcon fast-locking technology, which reduces installation time by up to 90%, can also be added to the products.